I really enjoy the Double Dutch Sampler Quilt Along. So far I've made several blocks based on two tutorials by my fellow Quilt Along-ers: the House block (second on the right in the photo below) and the Diamond-Plus block (second on the left). All the other blocks are things I improvised, blocks I enjoy making and there's even an 'orphan' X and Plus block I found in my stash that fits the colour scheme! This is just a small selection of the blocks I made, there wasn't any room left on the little improvised 'washing line'. :) Anyway in the Double Dutch QAL group on Flickr I spotted some so called 'Economy' blocks. I had heard and seen Economy blocks before but hadn't made any myself and a Sampler Quilt is perfect to try out blocks you haven't done before! So I made three for the Sampler Quilt but didn't stop there and started a new quilt. 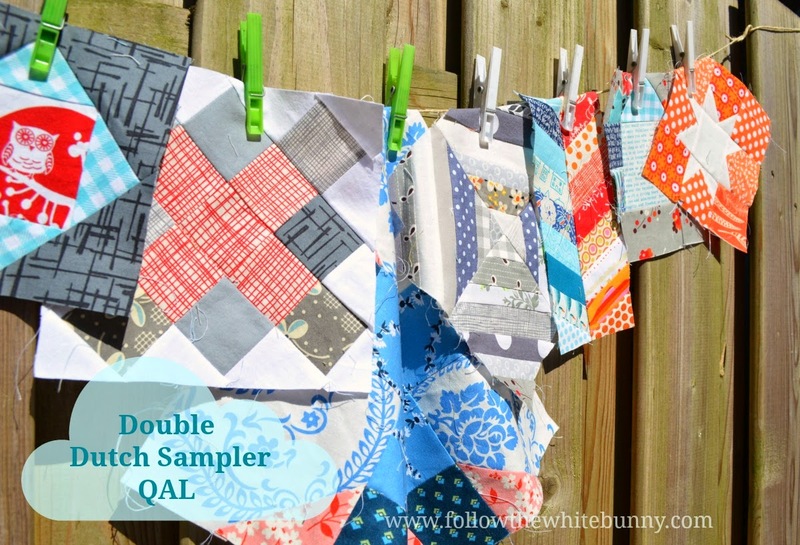 An Economy block spin-off of the Double Dutch Sampler Quilt! Again this is just a small selection (I think I have about 35 to 40 blocks now), just to give you an idea of the Happy Colour Scheme and fabrics I'm using. There's lots of Heather Ross' Briar Rose in the blocks and a lot of stash and scrap fabrics too. The Heather Ross fabric is really lovely to work with and has lovely bright, sunny prints of bees, clover, frogs, flowers etc. I saw some on sale here and here if you are interested. 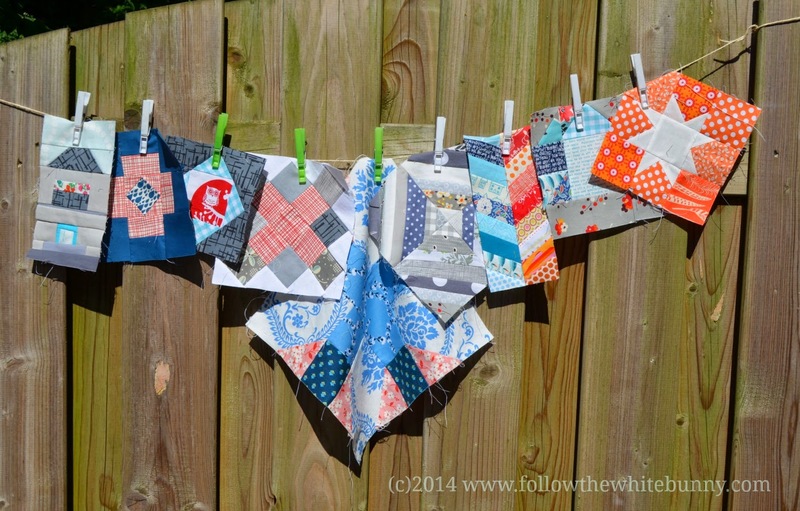 I used the Red Pepper Quilts tutorial for the Economy block and you can find links to the House and Diamond/Plus blocks and more Quilt Sampler inspiration here. Gorgeous blocks! 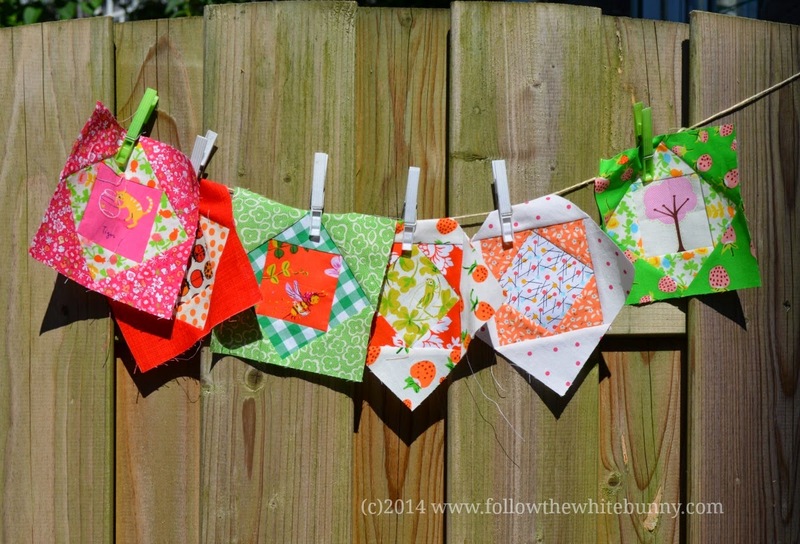 I agree that epp is the perfect summer project, great to be able to sew outside!